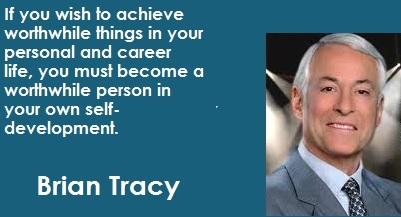 Brian Tracy is one of the world best speaker and writer of personal and business success. He talks about techniques and strategies for greater success in sales, self-development, personal wealth, business, leadership etc. In the spirit of admiring his work, I would love to share 10 great inspirational quotes of Brian Tracy with readers. These are the 10 quotes I gathered, if you remember any other quote of Brian Tracy, please share it in the comment box below. 2 Comments on "Inspirational Quotes of Brian Tracy"
Hi Ebrima! Thank you for posting your favorite Brian Tracy quotes. Those are very inspiring words, indeed. Today, I find it so wonderful, so amazing, that today you and I and others can encourage each other with such ease by publishing and corresponding through the Internet. I see from your profile that you are from The Gambia, the smallest country on mainland Africa. And here, in the USA, I am reading your blog. Many thanks for your feedback and kind words. They are genuinely appreciated.